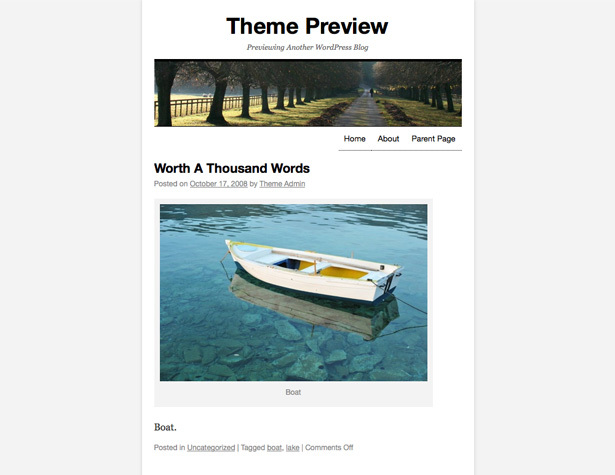 New WordPress themes are released on what sometimes seems a daily basis. But not all themes are created equal. 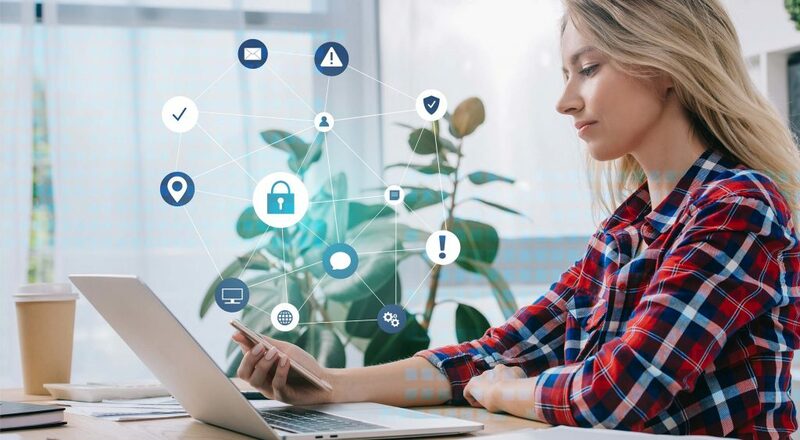 Differences in quality become more pronounced in free themes, but there’s even a lot of discrepancies in premium themes, both in terms of visual style and actual code. 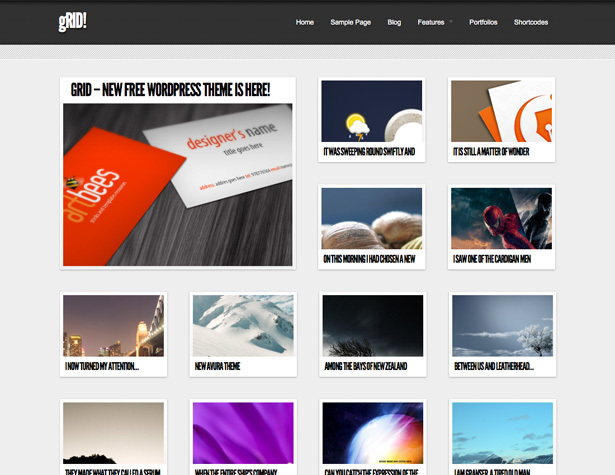 Below are more than sixty new WordPress themes released since March. 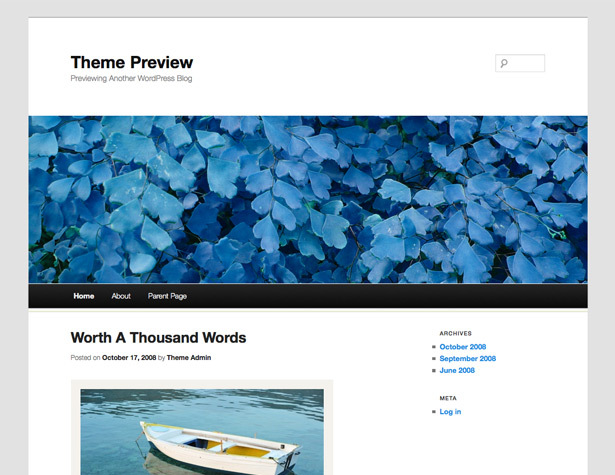 Roughly half are premium themes (ranging in price from around $15 to about $70) and half are free. 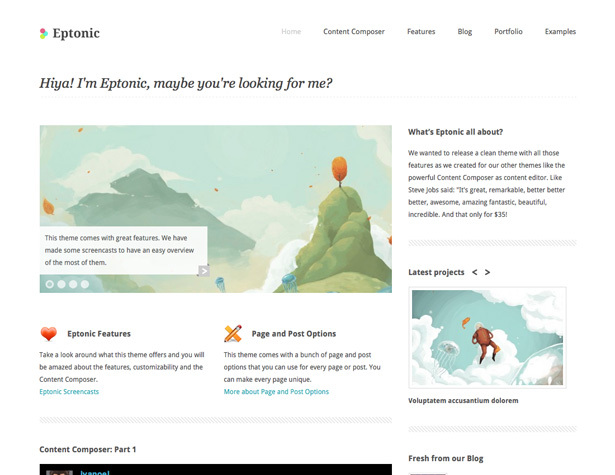 A minimal theme with beautiful typography and subtle gradients from Elegant Themes. 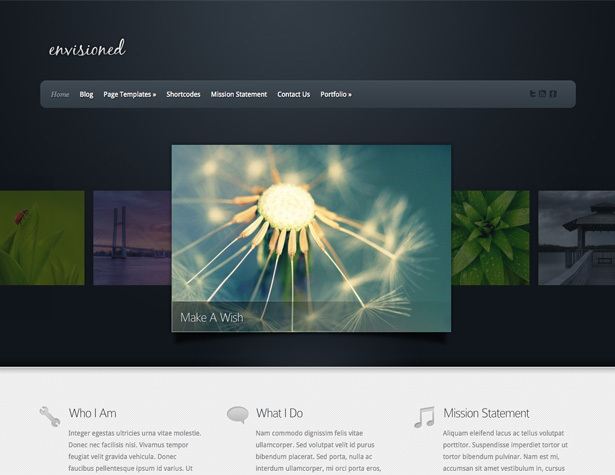 A powerful portfolio theme from Elegant Themes that enables creation of professional, multi-media galleries. There are three color schemes included (blue, purple, and green). Chameleon is a simple, professional theme from Elegant Themes with tons of customization options that don’t require any coding. 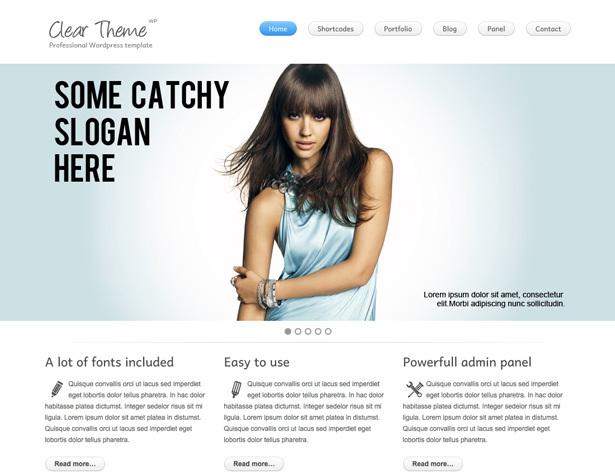 Feather, from Elegant Themes, is a light and airy theme with subtle details and textures that add interest. It has a ton of easy customization options included. 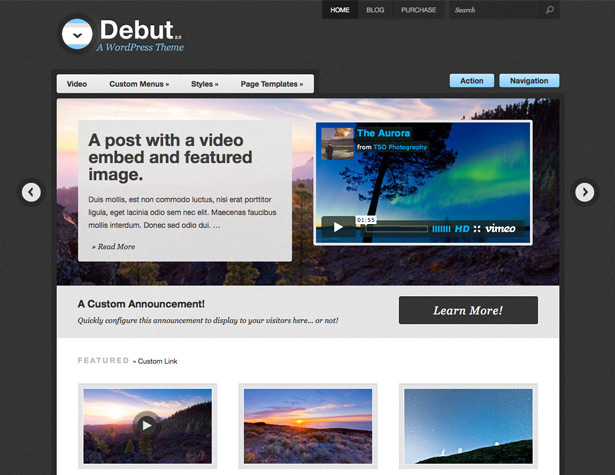 A video-based theme from WooThemes that is custom post driven, keeping your video posts separate from your regular blog posts. 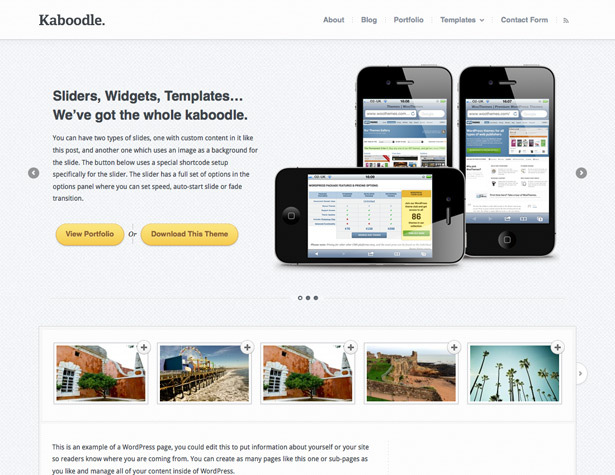 Kaboodle is a trendy business theme with lots of customization options, from WooThemes. 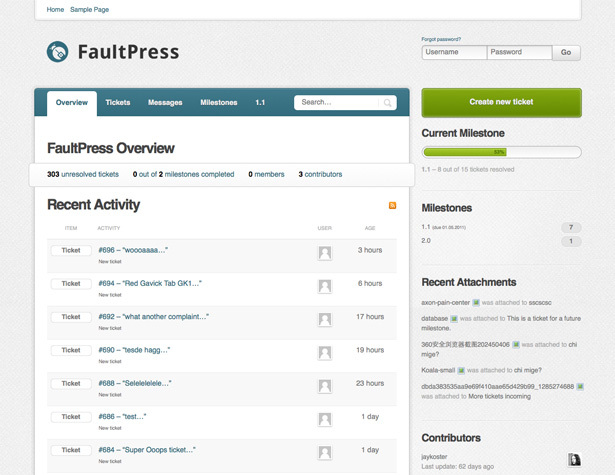 Faultpress, from WooThemes, turns WordPress into a full-featured ticketing application. 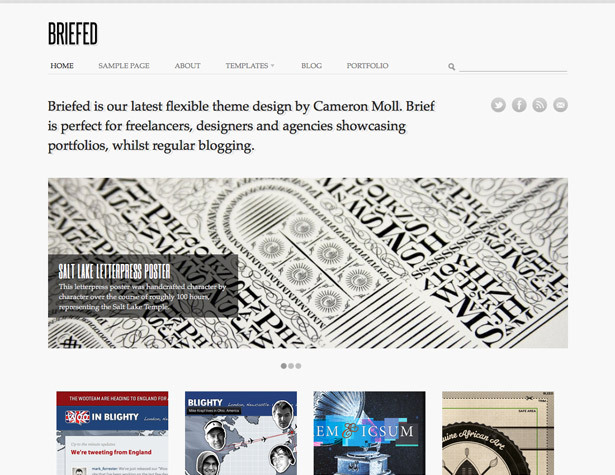 Briefed is a minimalist theme designed by Cameron Moll and offered by WooThemes. 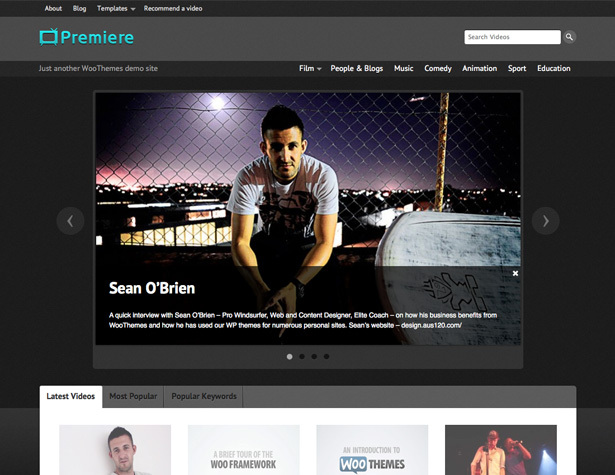 It has a modular layout and a completely customizable home page. 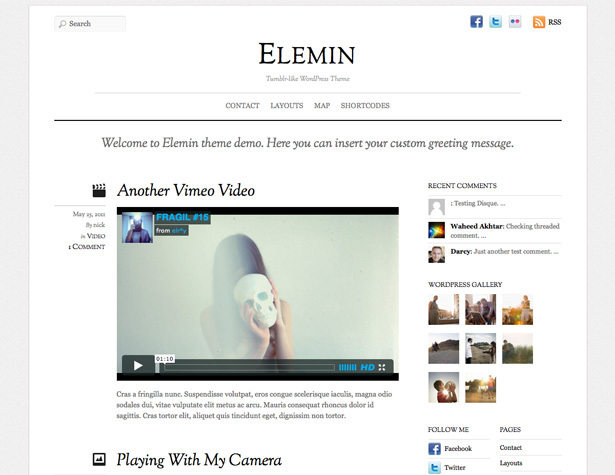 Elemin, from Themify, has a clean, fluid and responsive design created using Google fonts, CSS3 and HTML5. 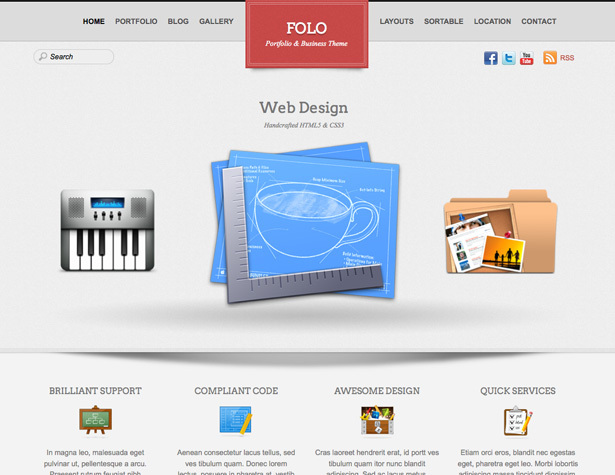 Folo is a clean business and portfolio theme from Themify. There are a total of twenty-one grid and list layout options included. 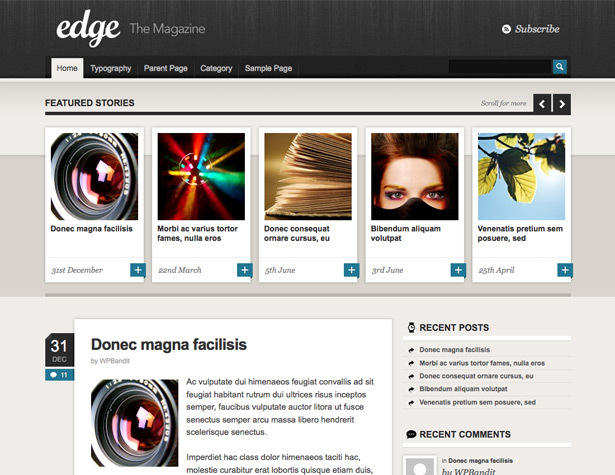 Edge, from WP Bandit, is a magazine-style theme that comes with fourteen different styles. 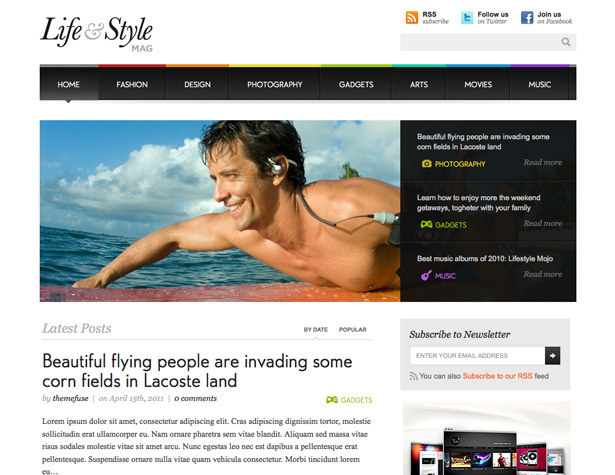 Lifestyle, from ThemeFuse, is a magazine-style WP theme built on the Fuse framework. 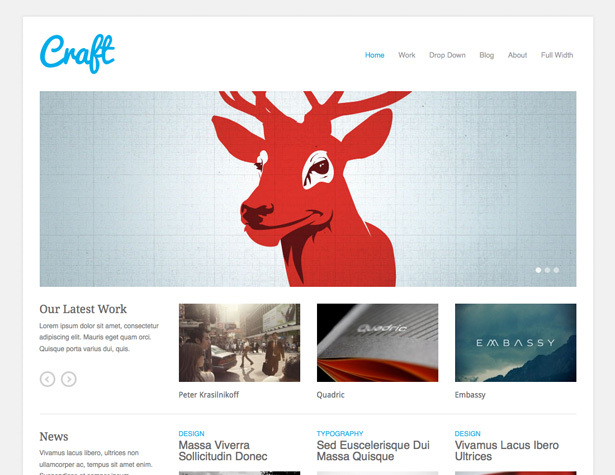 Craft is a minimalist portfolio theme from Theme Trust. 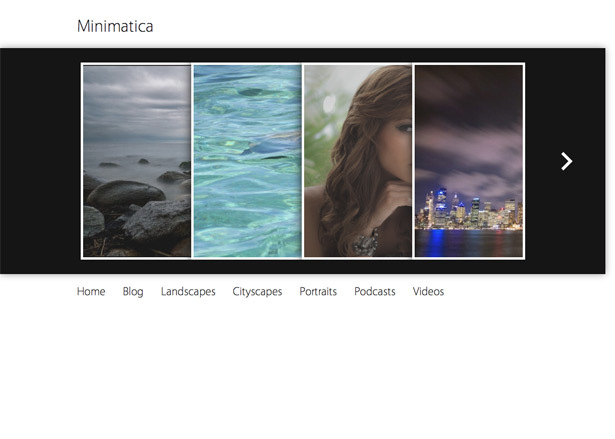 It includes slideshows on the home page and project pages, as well as intro animation for portfolio thumbnails. 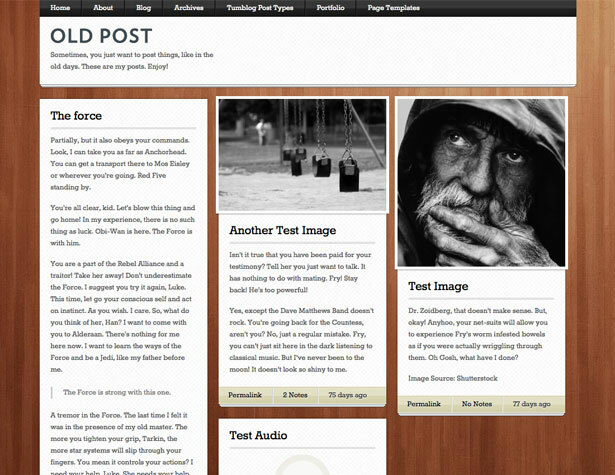 Old Post is a grid-based theme from Obox that includes infinite scrolling rather than pagination of posts. Abbreviate, from Obox, comes with thee different color schemes (light, dark, and brown), a typography manager, and tumblog functionality. 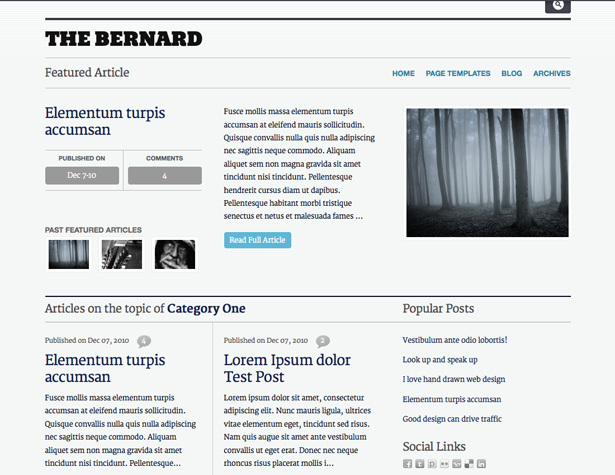 The Bernard, from Obox and designed by Brian Hoff, is a minimalist magazine-style theme with a custom slider and three color schemes. 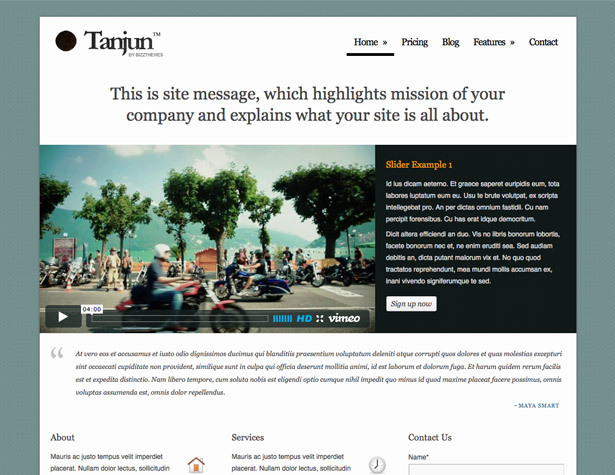 Tanjun, from BizzThemes, is a clean, professional theme that has a simple and fast slider and a variety of post formats. Immense, from Graph Paper Press, is a minimalist photography theme that adjusts automatically to the size of the browser. 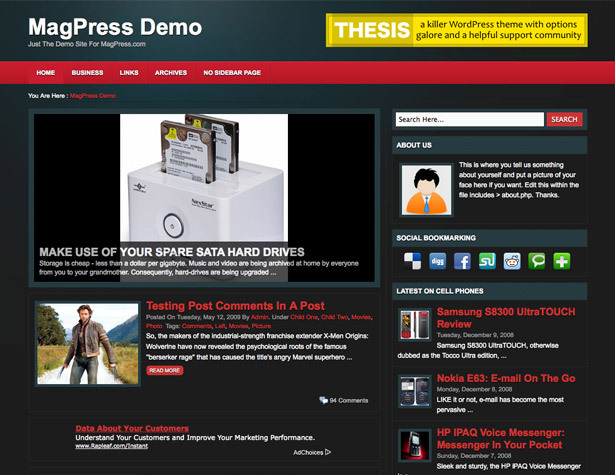 Press75’s Debut is a multimedia-ready theme that’s well-suited for news, magazine, and portfolio websites. 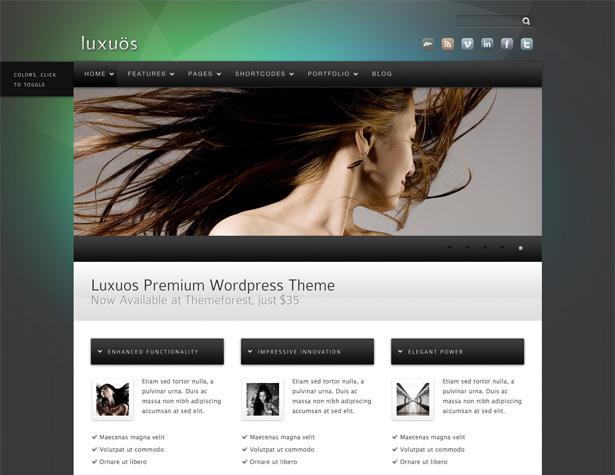 Luxuos is a stylish, flexible theme designed by ThemeShaper. 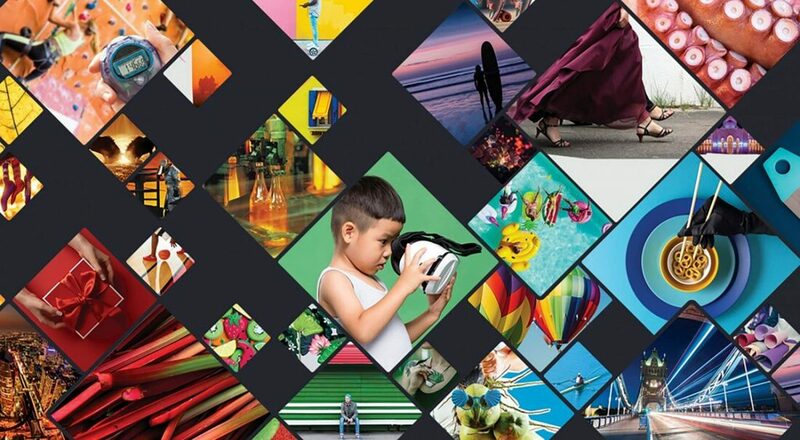 It’s suitable for corporate sites, portfolios, and photography or other creative sites. 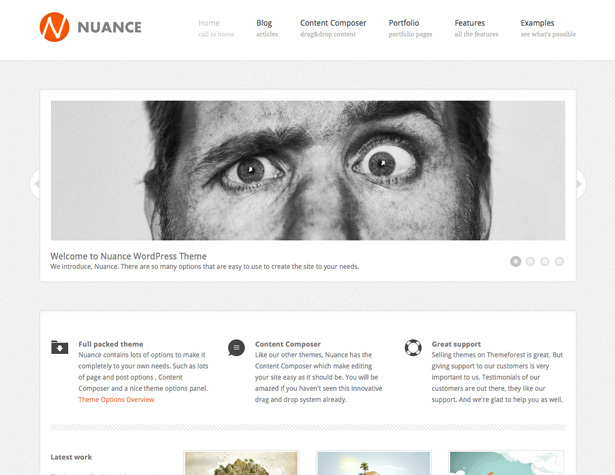 Nuance, available on ThemeForest, is a simple and flexible theme that includes the “Content Composer” for creating professional-looking pages quickly and easily. 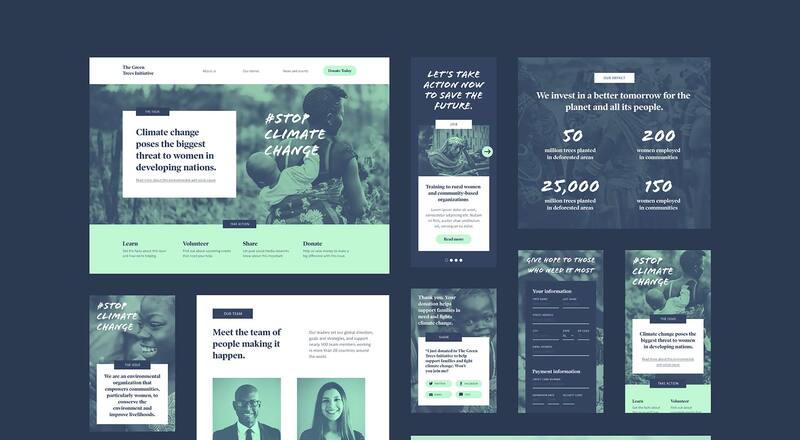 Pont is a modern multipurpose WP theme that includes multiple page templates, unlimited colors, 18 background patterns, and much more. 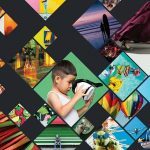 Halo is a stunning, minimalistic portfolio theme that includes full slider configuration, 14 different predefined theme styles, unlimited color variations, 2 image popup effects, and more. 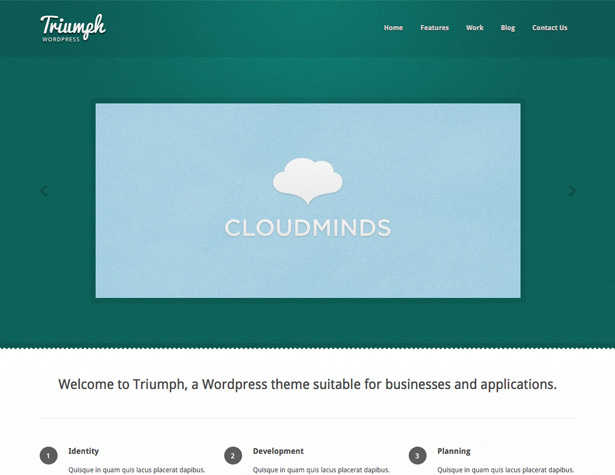 Triumph is a simple theme well-suited for business, application, and portfolio sites. It includes 10 color variations, several page templates, and more. 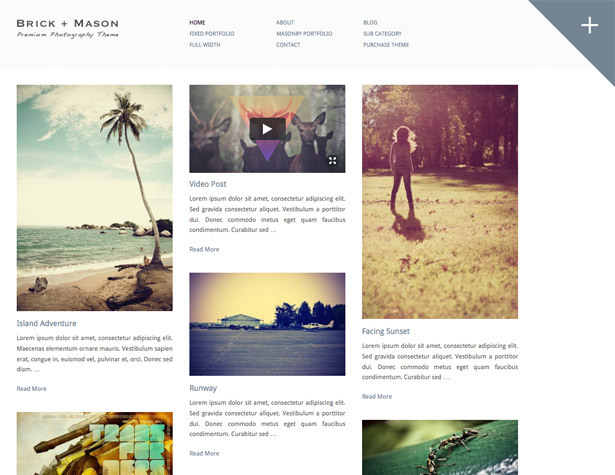 Brick + Mason is a minimalist theme perfect for photographers or designers. 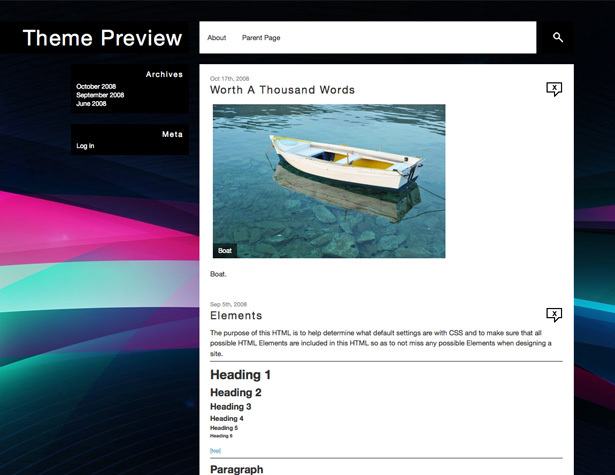 It uses the jQuery masonry plugin to rearrange content to fit the browser size. 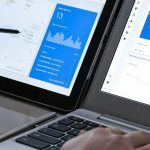 Gridlocked was designed specifically for creatives, and has a grid-based minimalistic style that supports post formatting and layout rearrangement. 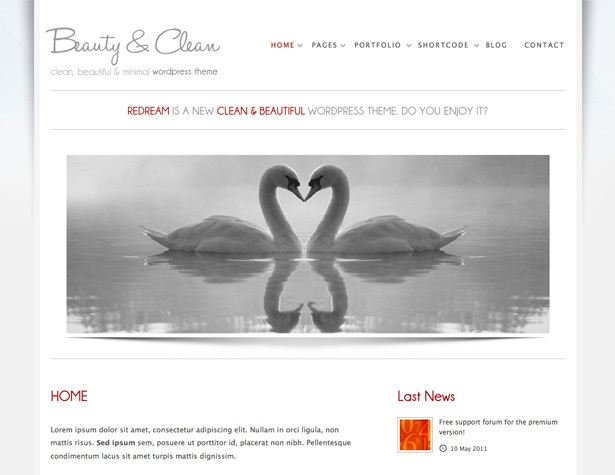 Clear Theme is a multipurpose theme with a modern, minimalist style. 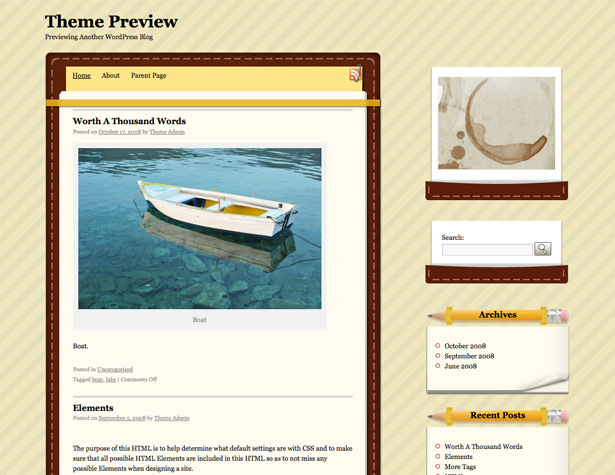 It’s suitable for blogs, portfolios, business and gallery sites. 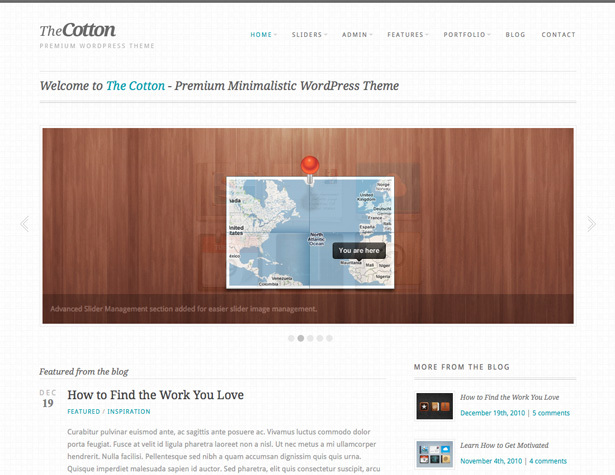 The Cotton is a minimalist WP theme powered by the Pexeto Panel, for easy customization. 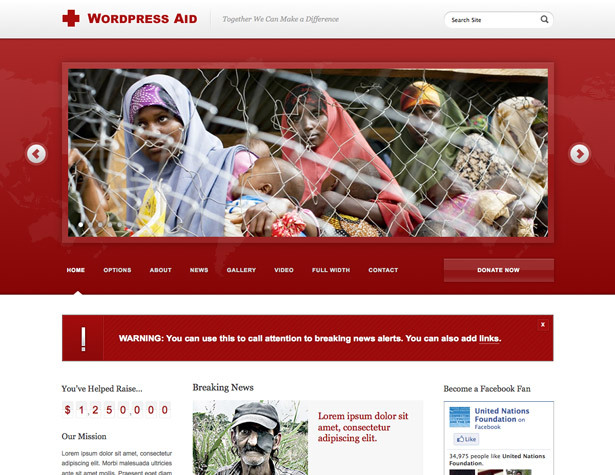 WordPress Aid is a theme specifically designed for use by charities and non-profits. 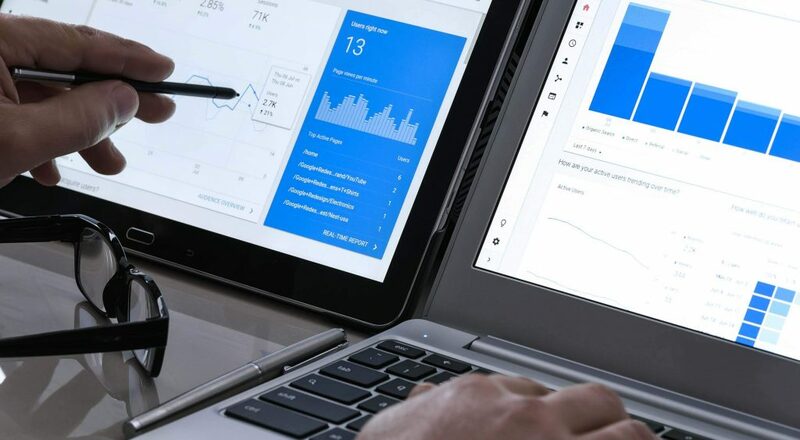 It puts the focus on fundraising and alerting visitors to important issues. 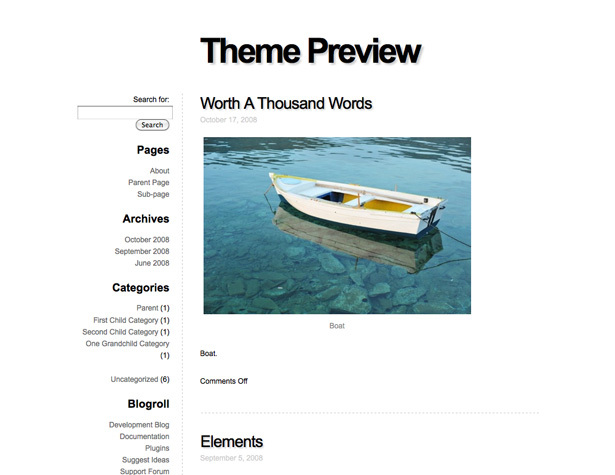 This theme includes the “Content Composer” for creating custom-designed pages. It also includes great portfolio styles and options. 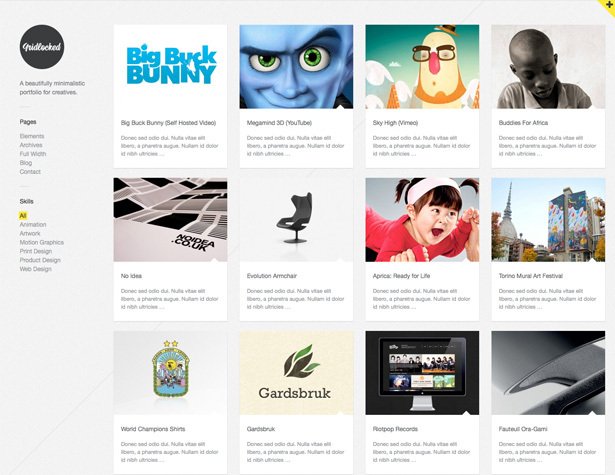 Portfolios are filterable and similar projects are shown on the detail posts. 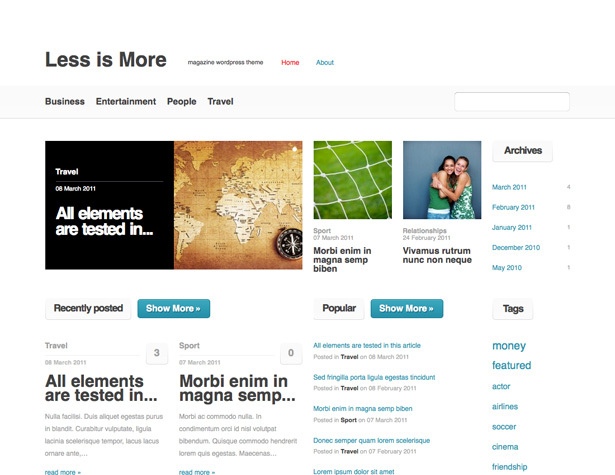 Less is More is a versatile magazine theme from 177Designs. It’s coded in HTML5 and includes 8 color schemes. 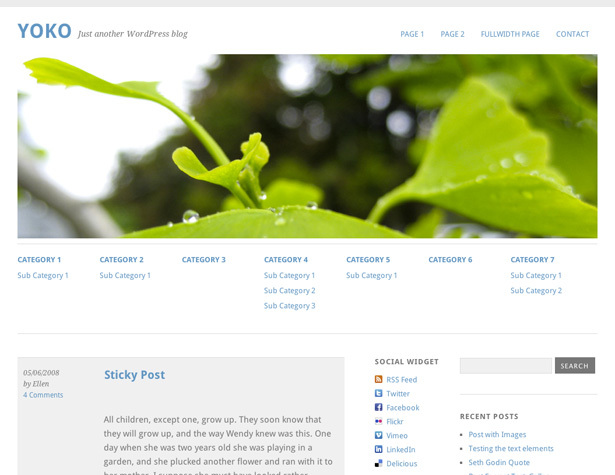 A minimalist grid theme with a four-column layout and automatic post thumbnails. 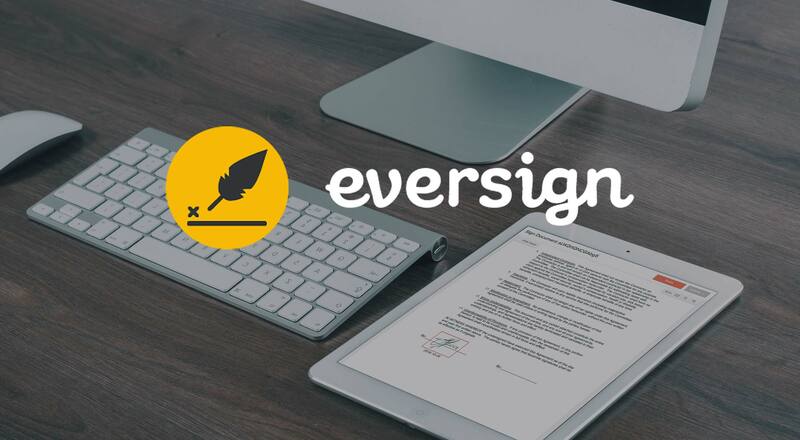 A portfolio theme from Padd Solutions that includes custom typography, custom front page widgets, and more. 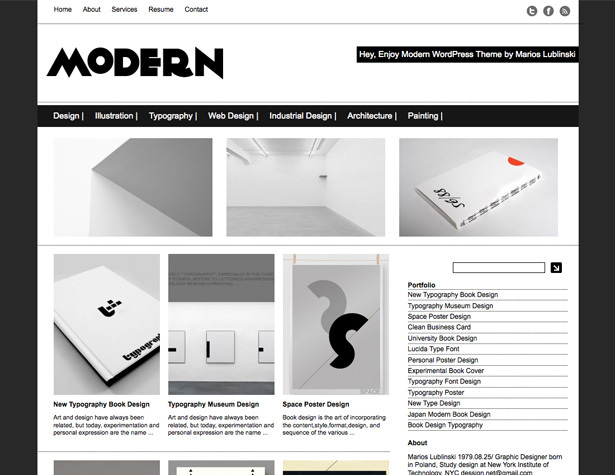 Modern is a minimalist grid theme from dessign. 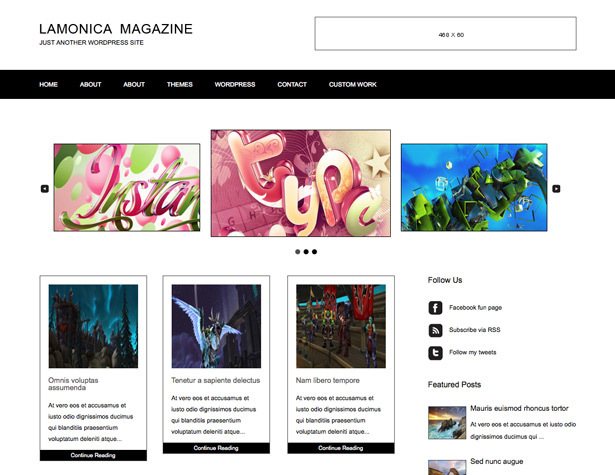 Lamonica Magazine is a simple grid theme with a content slider and multiple banner ad slots. 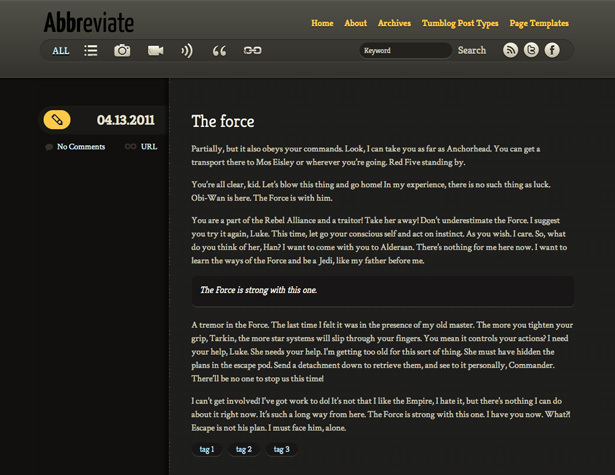 Maxime is a magazine-style theme with a dark color scheme from MagPress. 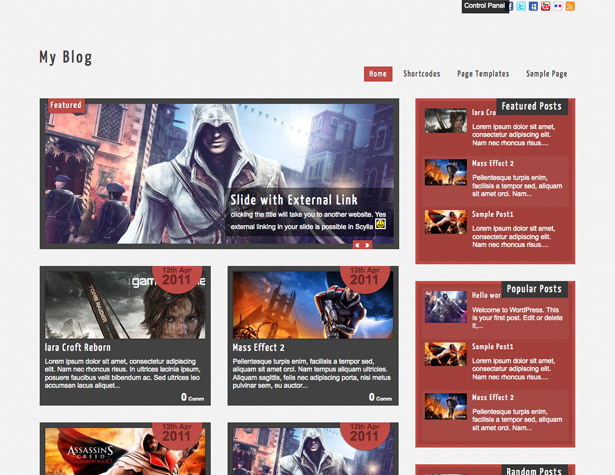 Horcrux is a fixed-width, two column layout with custom menus and featured thumbnails. 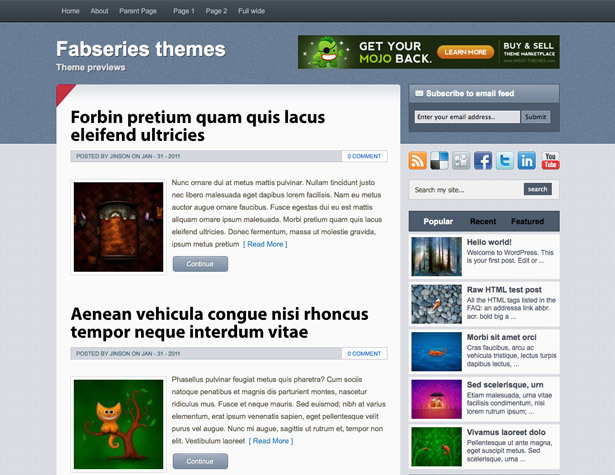 Scylla Lite is a simple three-column theme with four skins, a content slider, two different layouts, and more. 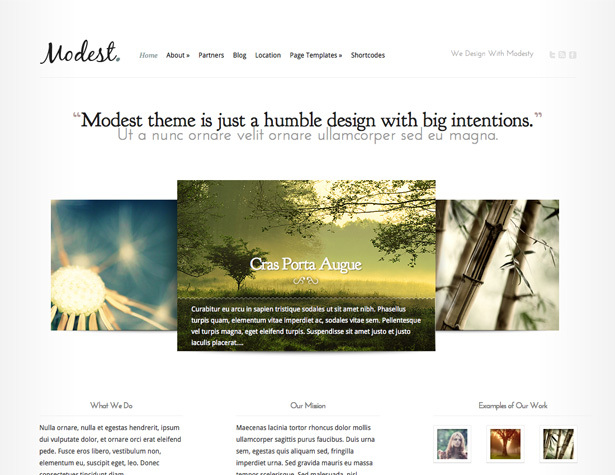 A minimalist WP theme with both premium and free versions. 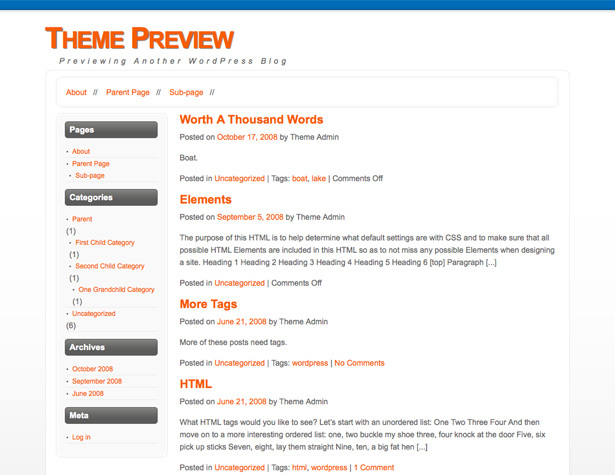 The free version includes five different page templates, custom post types, and custom widgets. 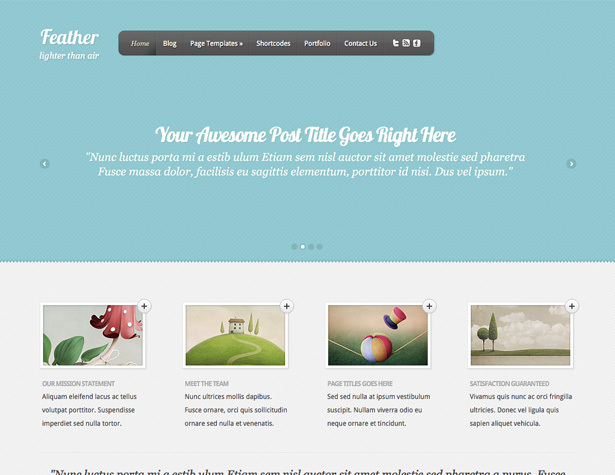 Fiver is a minimalist, image-free WP theme written in HTML5 and CSS3. 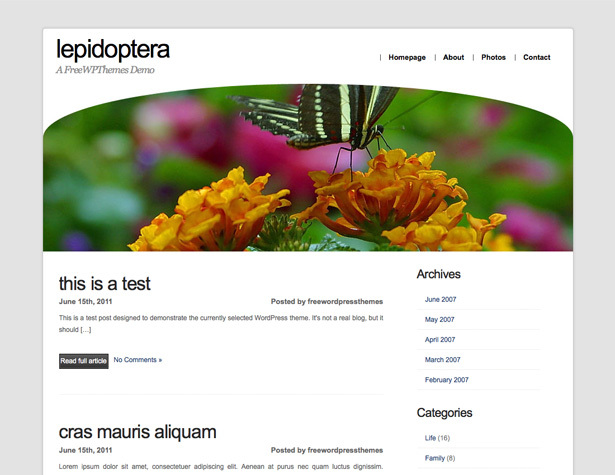 Corner is inspired by Windows Phone 7 and includes built-in Ajax navigation. 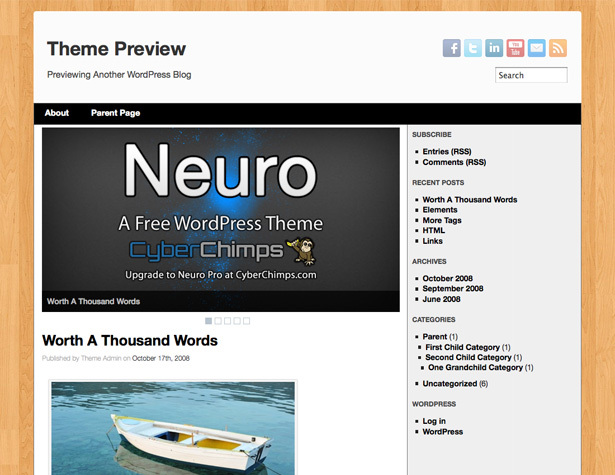 Neuro is the light, free version of Neuro Pro, from CyberChimps. 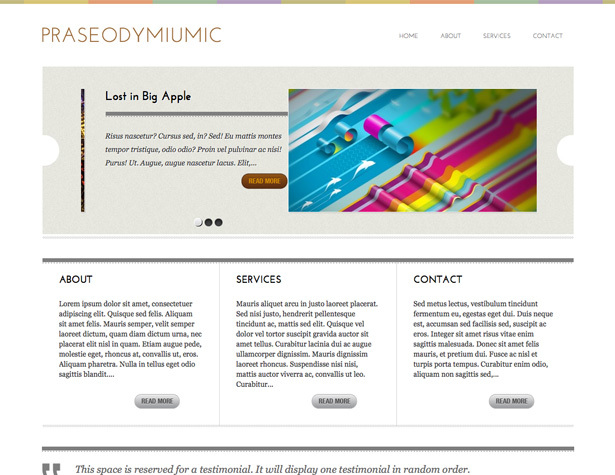 It includes two color schemes, two modern background images, and support for CSS3 and HTML5. Leathernote has a notepad design and has custom menus, works with “Aside” and “Gallery” post types, and has some special formatting for sticky posts and gallery thumbnails. 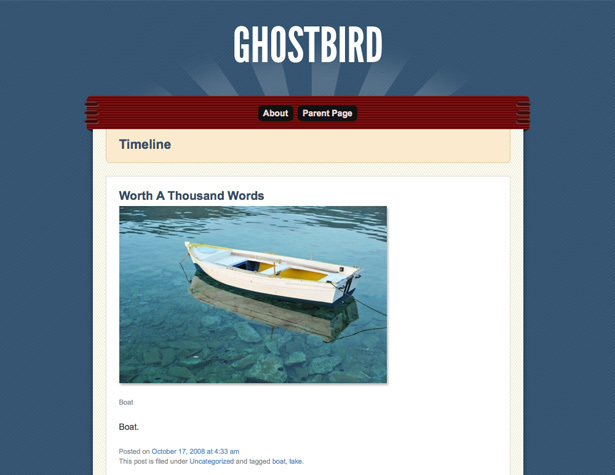 Ghostbird is a simple one-column theme with multiple textures utilized in the design. 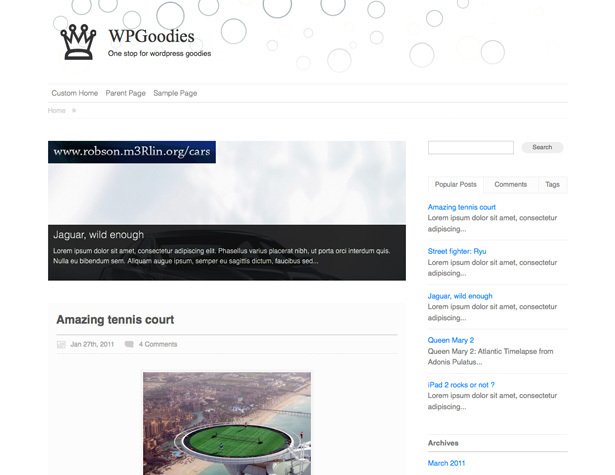 Grey Opaque is an elegant grey theme for WP 3.0 and higher that includes a single sidebar, and post meta information on the opposite side. Showcase is a bold theme with custom typography that’s well suited for portfolio and gallery sites. 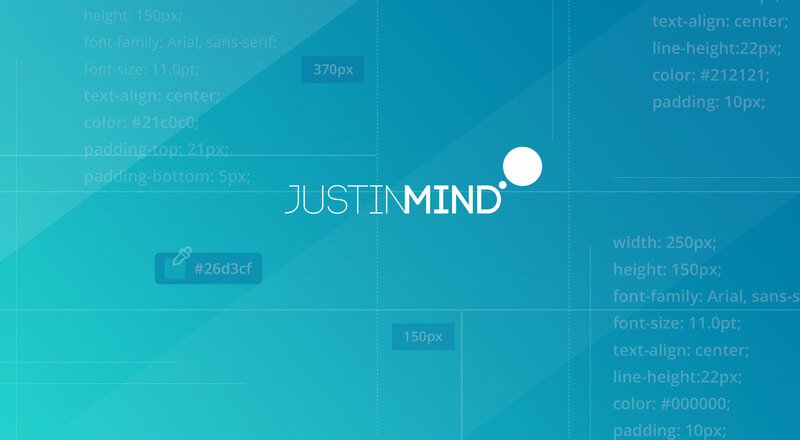 Desire is a two column minimalist theme with tons of features, including three layout styles, flexible width, custom header, background and logo, tabbed content, and more. 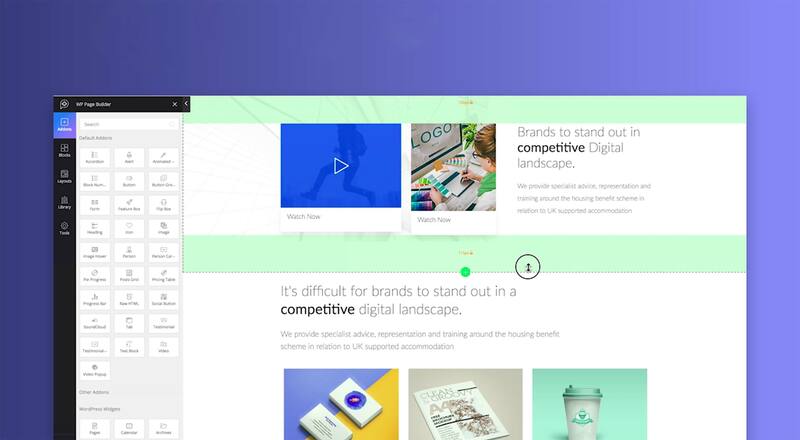 zeePersonal comes with 9 different color schemes (and a custom color picker for even more options), custom logo upload, and 3 styles of featured post sliders. 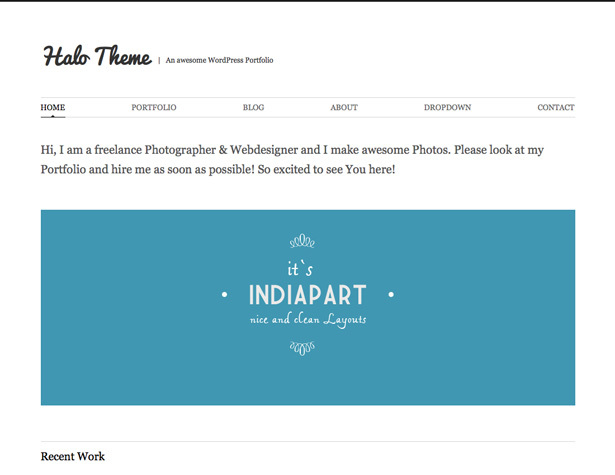 A minimalist theme with an image gallery slider that makes it perfect for portfolio sites. Also works well as a podcasting site, or everyday blogging. 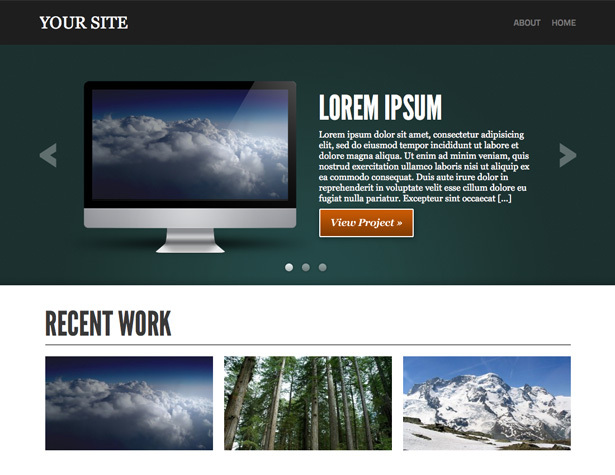 Yoko is a responsive WP theme design by Elmastudio, available from Smashing Magazine. 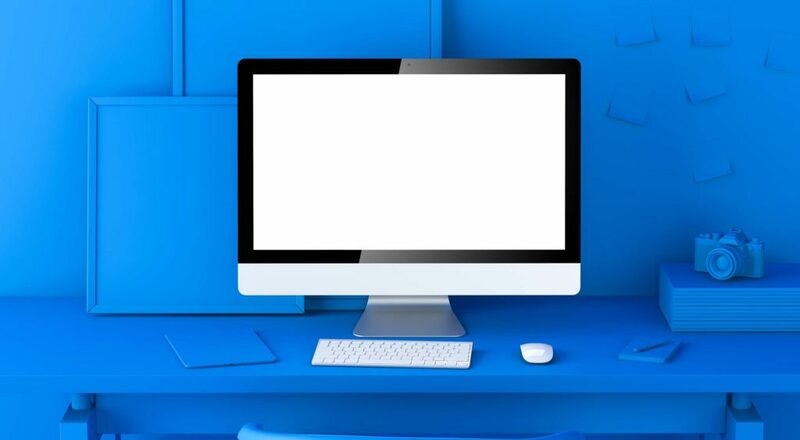 It’s coded in HTML5 and CSS3, and supports WP post formats, theme options page with custom background and header images, and optional sub menus. Duster is a free theme from Auttomatic. 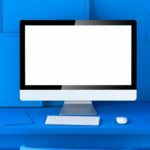 It has a unique page template that turns your blog into a showcase of different kinds of posts and supports other customization options. 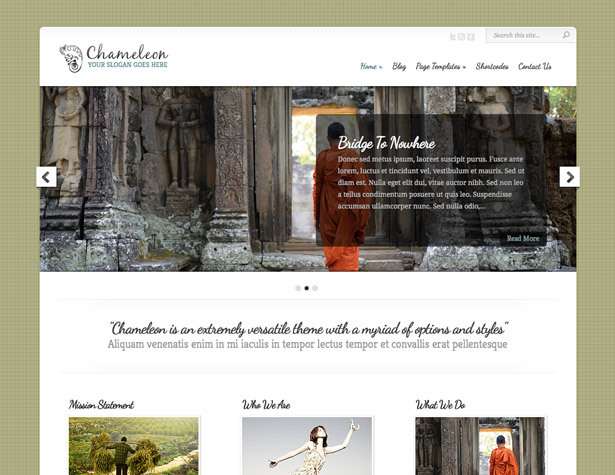 Light and Modern is a colorful, universal theme with modern menu and headline styling. 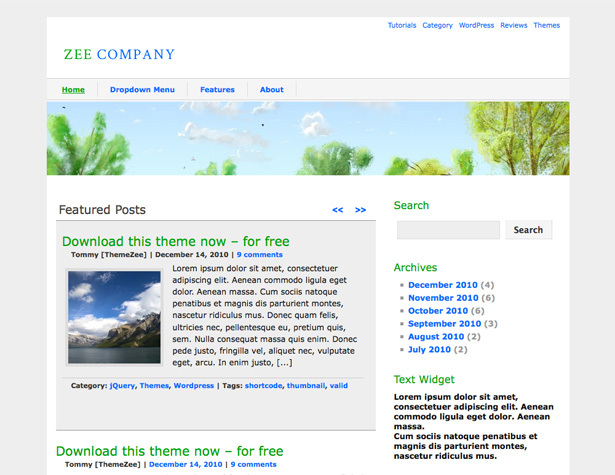 CSSFever is a clean and modern pure CSS theme with no images. 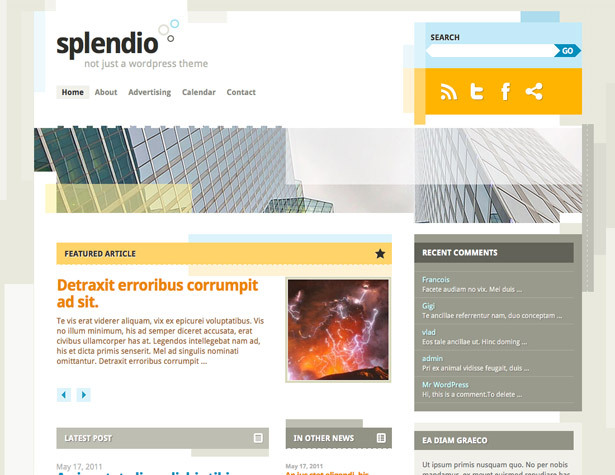 Splendio is another theme offered by Smashing Magazine, based on the Twenty Ten WordPress theme. 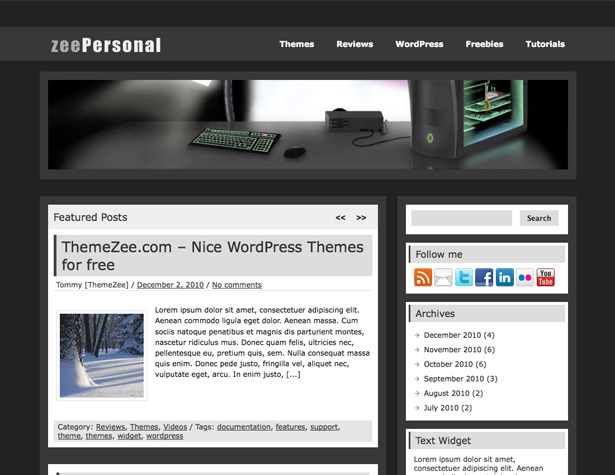 zeeCompany is a clean theme with 10 different color schemes, 3 featured post sliders, and lots of customization options. 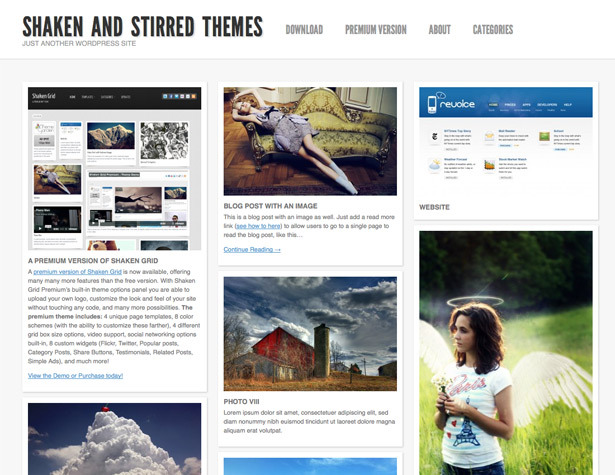 TwentyXS is a narrow, single-column minimalist theme reminiscent of the Twenty Ten theme. 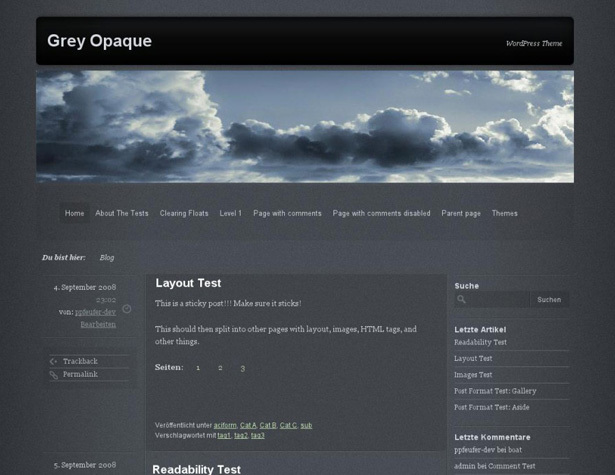 A minimalist black, white and gray theme with a curved header image. 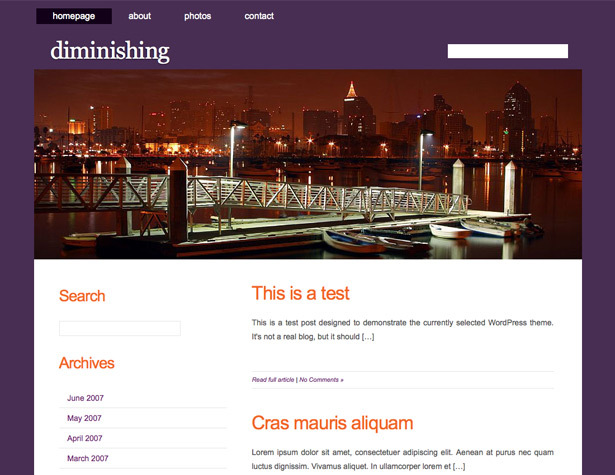 Diminishing is a simple two-column theme with a purple and orange color scheme and large header image. Shaken Grid uses the jQuery Masonry plugin to rearrange content vertically and horizontally depending on your browser size. 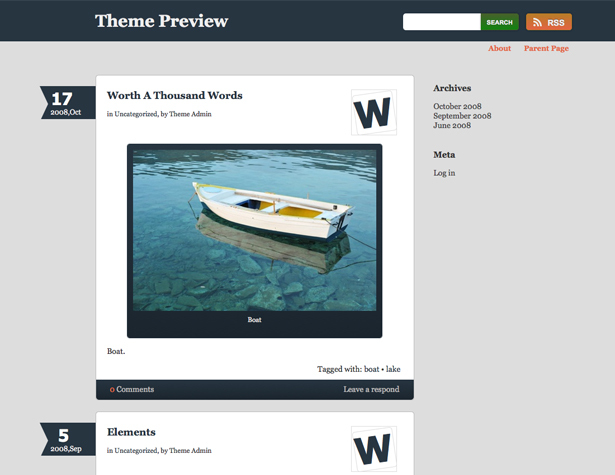 It comes with two color schemes, a theme options panel, gallery layout, and more. There’s also a premium version available. 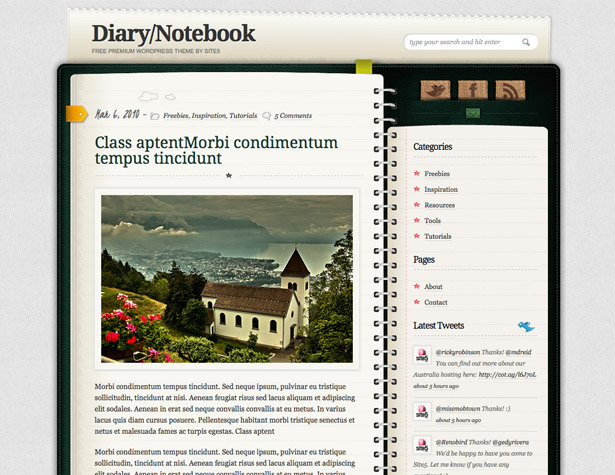 Diary is coded in HTML5 and CSS3, includes built-in pagination and the jQuery PrettyPhoto lightbox plugin, and uses Google web fonts. 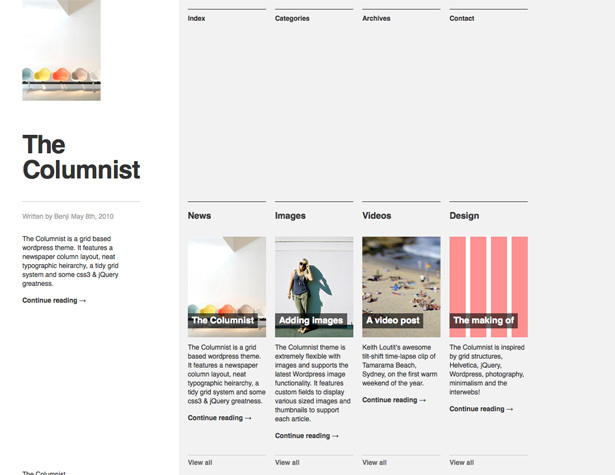 The Columnist is a grid based WP theme with a newspaper column layout, an ordered typographic hierarchy, and CSS3 and jQuery extras. 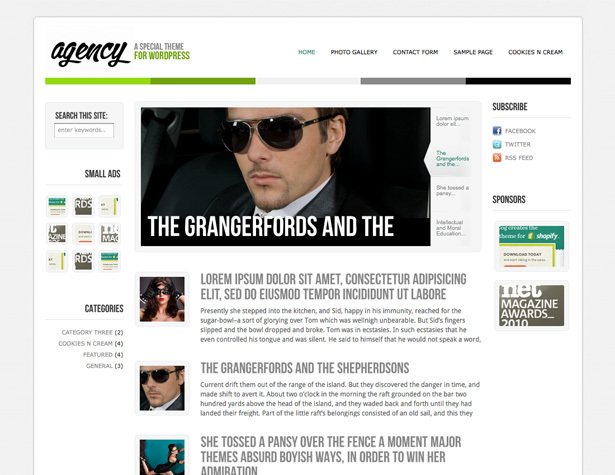 Agency is a free magazine-style theme from Fearless Flyer Web Design. 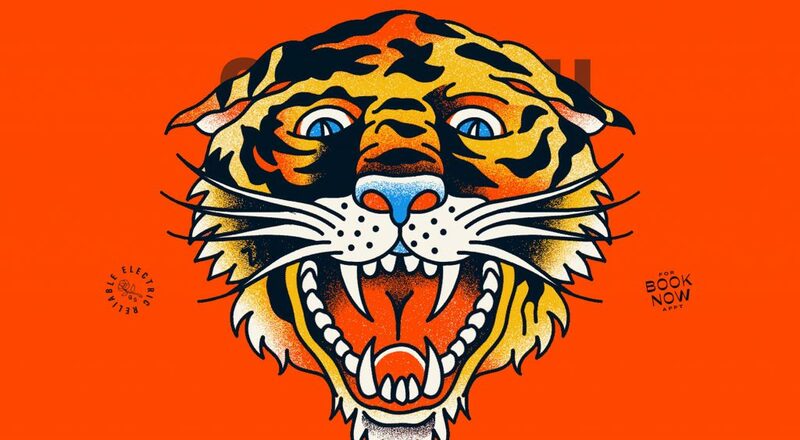 It has a very clean and modern design with beautiful typography. 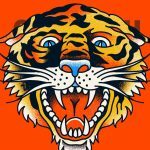 What’s your favorite new theme from the past few months? Did we exclude any you think should have been included? Let us know in the comments!